The residents of Planet Ithaca have a superiority complex that keeps them coming, uninvited and unwanted to the aid of Schuyler County, New York. Let’s start with recap of recent history that has to do with the trumped-up “life or death tipping point” that is occurring in Schuyler County, New York. A LOT has happened in just the last 2 months. A newly-named group “We Are Seneca Lake” has popped-up, with the requisite new web pages, one at www.wearesenecalake.com and another on Facebook (at https://www.facebook.com/WeAreSenecaLake ). There is obviously some good-money behind the webmaster. Gas Free Seneca, the opposition group formed against LPG-Storage in 2010 has posted many pictures of people proclaiming “We Are Seneca Lake!”. We already know the Gas Free Seneca bunch is a Park, Heinz and Rockefeller Foundations-linked bunch, whose money, with other donation, flows through the Sustainable Markets Foundation. That has been well-documented. The roots of the new group are murky, but we can clearly see the stamp of “Park Foundation-Funded Idealogue-Activist Group” on it. 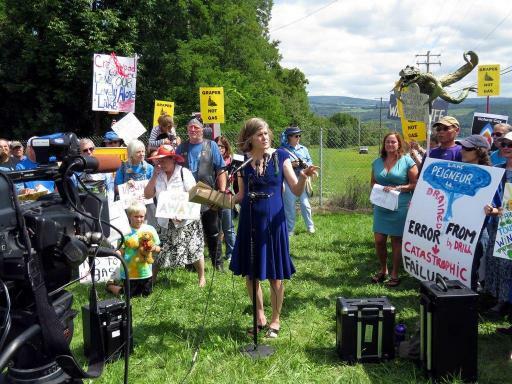 Sandra Steingraber keeps showing-up as a rally-leader, and protester/arrestee, photo-op leader, and jail-bird. There are a few other repetitive names and faces posting “Press Kits”, being arrested and such, but mostly it is a story of deluded and mis-led “useful idiots” being led to waste their time and energy to learn what the inside of courtroom and a jail looks like. But this group is different than the standard “group of concerned citizens allied to perform public education”, as most others profess to be. Their intent, most-clearly outlined by Ruth Young in a December 4, 2014 piece in the Star-Gazette, is to “punish” Schuyler County Legislature for daring to be supportive of local-business advancement and provision of new jobs. They want to make Schuyler County pay by having to fund the ladies to be housed in Chemung or Yates County Jails, and the guys in Schuyler County Jail. Yes, that’s right, they want to punish every resident of Schuyler County by having to pay higher taxes. That’s right, they think Schuyler’s taxes should rise towards….well, Tompkins County’s, for instance! This group is notably-different because it has members designated as “Arrestees”. They will achieve their goal to stop progress by using non-violent civil disobedience. The arrestees are of course ‘just special’, and wear red armbands to show it. The non-armband people are the 2nd-string, the supporters, needed to stroke the self-sacrificing Arrestees, make videos of their arrests, and provide ‘numbers, color and quotes’ for any news-people within reach. Yes, “We Are Seneca Lake” is a collection of the misguided individuals who have “drank the Kool-Aid” with gusto. They want to expand their resumes’ “Concerned about Mother Earth” section with bona fides to include being arrested for trespassing in the course of stopping progress on the facilities to provide the larger society with needed energy-storage services. In other circles those “arrestees” are tagged “useful idiots” — a term which harkens-back to the days of the ‘50s-‘60s anti-American radicals trying to promote the concept “Communists really DO know how to run the world better!” Many of the older generation will remember the infamous Saul Alinsky as their “PhD-Professor” aka “Community Organizer.” It is significant to current-politics that both President Obama and Hillary Clinton consider themselves to be disciples of his. But I digress…. FERC has already granted approval last summer to proceed with construction to store additional natural gas in a second cavity (the first has been in use since 1994). The surface facilities would not change substantially and most people driving-by on Route 14 do so without noticing, or caring, about the unobtrusive gas-handling facility installed there now. Gas Free Seneca, another front group of “The Ithacans”, has tried without any luck to foment angst about what could be seen from the other side of the lake. From the other side of the lake the ‘Seneca Gas Storage facility looks, to anyone without powerful spotting-scope, like just another barn, brewery or winery. Same goes for the view from Seneca Lake itself. And the same can be said for the surface facilities needing installation for the LPG-Storage function. Even though they have a larger ‘footprint’ for Brine Ponds and the 32-RR car capacity loading & unloading spurs, they will just not be particularly-noticeable nor look out of place. Whereas the wineries are generally made to be noticeable from the highway, these facilities have the opposite desire – to be unnoticed – since they are not intended to attract the public, only serve its needs indirectly. There is more than just NIMBY-ism at work here (NIMBY-ism = ‘Not In MY Back Yard’ – put it in SOMEBODY ELSE’S back yard!). Some “end of the world old-time-religion” is now present. Yes, the anti-gas+LPG people have convinced themselves that “the end is near” if any facilities are built and operated right here, on the hillside overlooking Seneca Lake. Yes, this facility will be different than the other New York Facilities for storing gas (26) and LPG (3). Yes, 29 facilities in the state, already!! Who would have guessed!? Unless you do a little digging, you just don’t realize how much of that ‘storage’ business goes on without being noticed at all! This over-the-top hyperbole (check it out here), is contradicted by the existence of those other 29 storage facilities, which I discussed on these pages the other day. ‘Storage’ is really just ‘fracking’ by another name, and we know that really is the end of the world! “I have come to understand climate change as a mass murderer that has my children in its sights. (And fracking is its toxic, thuggish, water-destroying accomplice). That was from Sandra Steingraber’s “Crappy Mom Manifesto: Letter to Fellow Mothers from the Chemung County Jail.” It was half pity-party and half-propaganda. I could go on, but it becomes repetitive; just keep your eyes and ears open for your own favorites. 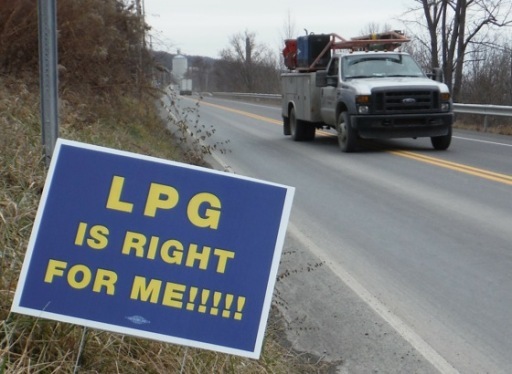 LPG and natural gas will contaminate Seneca Lake! Yes, there are people out there who don’t let the laws of physics and chemistry get in the way of their imaginary delusions. They don’t understand that even if these those valuable hydrocarbons somehow made it into the lake, they are immiscible with water, have low density so they will float to the top of that water, and they have high vapor pressure so will evaporate and disperse rapidly at the surface. Nor can they explain just why these valuable stored materials would leak. There is no history of surface fault movement in NYS in known history. “Surface faulting” is not to be confused with earthquakes from stress-relieving deep in the basement rock. 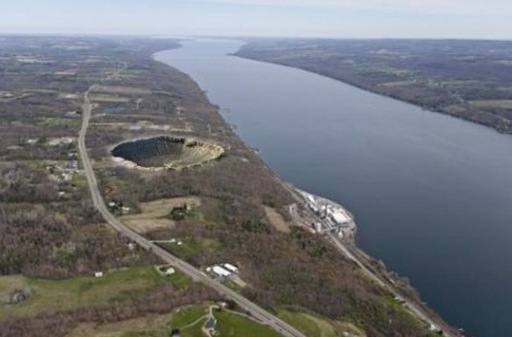 Even the little one under Seneca Lake that occurred in 2013 was >5 miles deep, in the basement rock. Others think disaster-scenarios are possible because they do not understand the “plastic” nature of the salt under pressure from the weight of rock above it — it is a self-sealing substance, and also seals the shale layers within the salt. Salt will contaminate the drinking water for 100,000 people! First of all, this lake only supplies water for ~55,000 people. Rounding-up as was done here is not good technical practice, and is misleading. Some picture the ground as so fractured that it is inconceivable that gas or LPG would want to stay in a cavity. Others like to picture contamination happening “Hollywood-style” with huge cracks opening in the earth, and brine and hydrocarbons squirting-out every which way. Why? Well, Cavity #2, you see, will be “different” than Cavity #1, which has not leaked now for 21 years. Similar in “not leaking” to the other 28 storage facilities in NYS that have not leaked. Some picture contamination happening through brine pond failure and spillage into the lake. The problem with this scenario is that engineered impoundments are not known to have a failure-rate higher than zero. Those 8 or 10 jobs are too small to worry about to trade for the ‘risk’. Yeah, jobs are like that sugar cube in your coffee. You don’t miss them until not there! Ask anyone paying a mortgage, who is suddenly laid-off due to the end of tourist-season, and is facing 6 months before their return, how much they miss a ‘real job’. With benefits valued at another ~25% of that. Then you ask: Does that ‘ag’ job worker do some other part-time job in the off-times, or do they collect unemployment benefits, or welfare? Well, you get the idea – full-time jobs that can support a mortgage are worth a lot more to an economy that are part-time minimum-wage jobs. That is why New York was hurt so much when its taxing-practices chased so many manufacturing jobs out of state. The budding wine and tourism industry will be ruined! Again, back to ‘NIMBY-ism’ to introduce some levity for you. These readers are surely familiar with ‘NIMBY’, for “Not In My Back Yard”. But do you know that outlook has advanced to the new Ithaca-special version ‘BANANA’ for “Build Absolutely Nothing Anywhere Near Anything” (or alternately, ‘Anyone’). And the more-radical elements have had their philosophy tagged as ‘NOPE!’ (Not On Planet Earth!). Keep these acronyms in mind for the next speech, article or opinion against some form of societal-progress that ‘antis’ are trying to roadblock. Late in October the ‘arrestees’ took to blocking one or two gates off of Route 14 leading into the Seneca Gas Storage facility, and the Brinefield in general. The idea was to bring construction around the 2nd gas cavity to a halt. This got off to a bad start because….NO GAS-CAVITY-RELATED CONSTRUCTION WAS OCCURRING! They spent several days standing-around not bothering anyone, until on October 29th a semi-truck tried to deliver some oxidizer used in the brinefield. They stood in front of the semi, who stopped, tried to reason with them, read the tea leaves correctly, and called the State Police. In 20 minutes the protesters were arrested and hauled-away. It actually went better than they expected — the officers did not discriminate, as they took both “arrestees” (with the red arm-bands) as well as “supporters” (to their chagrin and shock!). 10 total. Anyone standing in the way of progress was….gone! Four days later they came back with a big crew of ‘arrestees’ on November 3rd and 15 were arrested and booked. There was a 2-week lull and then they hit it hard for 5 days straight: 10 arrested on the 17th, then 8, 9, 9 and 12 more on the 21st. That brought the total to 73 arrests. But an interesting thing was happening, and social media helped bring the facts in front of many people: Only a few of the ‘arrestees’ were locals (Schuyler County residents), and the rest were from all-around, but mostly from “The People’s Republic of Ithaca” in Tompkins County, which does not even border Seneca Lake (that’s Cayuga Lake over there, similar to Seneca, yes, but distinctly different). “The real outsiders? The Texas based Crestwood. From thousands of miles away they plan to exploit our beloved lake, hiding facts (such as the maps) with blatant disregard to our safety and to our lake and our local economy. The protesters must have expected the locals to rally-round the cause, and were stunned to find they didn’t jump on the bandwagon. Even more stunning was that they dared to criticize the arrestees and others as ‘outsiders’ coming to tell the ‘locals’ what was good for them. The ‘score’ as of November 21st stood at 8 arrestees from Schuyler County, out of 73 total arrests, with a few being repeat-offenders. The protesters took Thanksgiving week off, the came back on December 1st with their response – they had rounded-up a dozen ‘locals-only’ as that day’s arrestees. They expected to get it over quickly. After standing-around for hours a couple of them left to do “real work”. Then the rest (10) “got lucky” after about 7 hours, blocked a truck, and were promptly hauled off to booking. Things reverted to almost back to normal on December 3rd, with 9 total arrestees, of which 4 were from Schuyler County. Obviously, Schuyler County is at the nexus of this story. Yet, only 11% of the arrestees were from Schuyler, until the protesters were stung by how lop-sided the tally was. In the next 2 days, they brought the Schuyler arrestees to 24%. The evidence is that they are running-out of reserve sacrificial arrestees, and this attempt to flood the jail will not continue. The plot was never destined to work very well anyway, as there are only a limited number of arraignments (20 or so) scheduled per the once per 2 weeks court sessions (the other Town Judge recused himself as he is a US Salt employee). Don’t Mess with Our Jobs! OK, now it is time for the final analysis with the help of Google’s ‘Earth’ Software. We Are Seneca Lake has thoughtfully provided data on each arrestee’s hometown in most cases on their Seneca Lake Defenders page. One, Patrick Judson, has moved from Trumansburg, where he was initially reported to live, to claim Burdett instead, where he apparently grew up, as his mother lives there (she is also an “arrestee” with him, on the same day). Burdett is in Schuyler County, whereas Trumansburg is not. The numbers designate the “arrestee #.” As you might expect, they look to be scattered around the Seneca Lake area. But are they? Now we are starting to see patterns in the data. There are groupings at Hector/Burdett/Cayutaville, Trumansburg, Ithaca/Lansing and Dryden, with a small cluster up at Geneva. 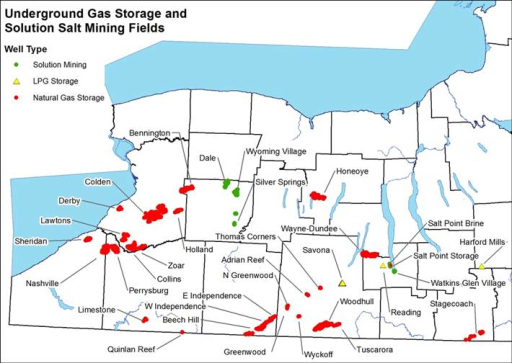 But note the paucity on the west side of Seneca Lake where gas storage is actually proposed. Seems odd, doesn’t it? Here we see some shocking-truth: There are absolutely no (ZERO) arrestees from the west side of the County at all! And, just one from Watkins Glen itself. If you understand the local-sociology situation, you will recognize the source of the east Schuyler arrestees is what has become a bedroom community of Ithaca; the Hector/Burdett/Cayutaville ‘northeast Schuyler’ half which is collectively “Hector.” When you lump those residents in with Tompkins County, you find they comprise more than half of arrestees! You’d think the locals would be up in arms, wouldn’t you?? Why not? After all, you know, the residents of the “Sacrifice (or Blast) Zone,” are the “Ground Zero” of the upcoming “End of the World”!! But just the opposite is true — if absence implies consent, they are voting with their feet to consent to gas and LPG-Storage, and avoid this “arrestee” silliness. So what does the map tell, as a story, besides this? Perhaps: “The closer you are to Planet Ithaca, the more gullible you are to ‘anti’-influence?” Does it have to do with the 2nd or 3rd-generation spoiled-brat trust-funders who attend there? There is a dearth of hard-workin’ farm kids among that crowd. Or is there truly something in the water there, as many have speculated? Or is it perhaps….the hazy smoke from “home grown produce” there, combined with mirrors manipulated by the Park Foundation? Answer with your best guess as a comment, please. Mr. Crea is a US Salt technical professional employee who is involved with their brinefield and wells management, but writes this as an interested citizen-observer, not as a spokesman for Crestwood or US Salt. Great article Dave! Keep up the great work with speaking the truth! Credit has to go to you Bill Huston indirectly for an idea stimulated by your PhotoShopped picture above! Some ingenious Civil Engineers now believe that a small truckload of dynamite, placed underground maybe 40 feet, would be a quick and easy way to construct a new Brine Pond! Make the hole, the raised edges are the dikes, then double-line it, and wallah!–DONE in record time! Really ‘blasts-away’ the construction time needed…..
Dave this is by far one of your best articles ! If you want to end the agony just make the arrested protesters work for their keep. I see you made a hippy comparison ? The hippies protested war not clean energy. Why not label this movement of protesters hippacrits? Ironic aint it Dave, they are just a bunch of paid lobbying pros from the other side ! Dave: great article. The worst of the invaders is the agitator Steingraber. Seems like she is not happy unless she is making someone’s life miserable and intolerable. In this case, trying to shut down Crestwood which in turn will make the price of propane skyrocket which in turn will bring great financial hardship in the Finger Lakes area and beyond where the local residents are already struggling as they mostly toil in the vineyards, craft breweries, yogurt factories, and organic farms making minimum wage. Holy Mackerel Frank! I had NOT been aware of that one before! That is a dandy. I have posted a comment asking why the water wants to violate the laws of physics in this instance, as he maintains it is “lost” to the hydrologic cycle, which is not true at all. Dave I use o make ponds in korea . we would take 80 pounds of c-4 and put it on a tripod 3 feet above the ground, get back a mile and cap it, you would get a circumference about 160 ft across the middle and 15 to twenty feet deep holding roughly 4-7 million gallons of water. Great real-world example Vic! Looks like all we’d need is about twice as much C-4……Probably best to “construct” at noon on the 4th of July! I can now give some insight into the “court appearance and arraignment process” occurring up at Reading Town Hall. To no one’s surprise, the “locals” are fed up with the “Circus Atmosphere” that these crusaders bring to every session of Judge Barry’s courtroom. They have had stinky and barefoot people walking around the Town Hall, and some rabid videographer sticking his unit in the Town Clerk’s face, and then trying to videotape the scene in the courtroom from OUTSIDE in through the window! The deputy chased him away since no recording is allowed. A bunch of them get there early and want to come in where it is warm in the Hall, and pester the Clerk. they’ve had trouble with people trying to crowd-in far above the Occupancy Limit, and the Deputies have had to do “people-counting and control” for that purpose. On a positive note however, the Court’s Income is notable, and the Board is thankful for that! The events of this week and the court arraignments last night showed a not-so-friendly face of Schuyler County to the “Ithacans”. First of all, the access to warmth and the restrooms at Harbor Hotel was denied to the Protesters, because they were tracking in dirt, stinking-up the place, and spending no $, and giving the place a bad image just by “rallying” with it in the background of their photos. Up at the Reading Town Hall, where the parking by the protesters has become a nightmare and the event a “circus atmosphere”, the Town and County posted “No Parking” for 1/4 mile on each side (and had a tow truck waiting for victims), forcing some long walking. Inside, the judge got wiser, and instead of sentencing non-fine-payers to jail, imposed a “Civil Judgement” against the non-paying individual that will go on their Credit Report and sit out there against them until cleaned-up. And that will effectively prevent them from getting any new loans, and that sort of thing. AND, it keeps the County from having to pay for female incarcerations at Chemung or Yates County’s Jails. About 7,000 Schuyler Taxpayers are happy about that! My prediction: The next “Best Free Show in Town” will be at the final Schuyler Legislature Meeting of the year on December 29th, with both accolades and darts thrown at the Legislators. Don’t miss that show! There were 41 more arrested on Tuesday, Dec. 16th, and only 7 were from Schuyler County. Quite a number were arrested for the 2nd or 3rd time. Even the infamous-in-PA Vera Scroggins came up for that performance! In general, that was a group of Ithaca Teachers, and gives a straightforward demonstration of how liberal/progressives have infiltrated the school system. Then on Wednesday Dec. 17th, 28 “musicians” were arrested, and again it appears that perhaps 1/4th were from Schuyler County, and those were of course “Ithacans” in all but mailing address. These two days bring the total of arrests to 161. The ‘locals’ are getting more and more fed-up with this. The Ithacans’ belief that they could overwhelm Schuyler County’s resources, and send Crestwood packing, is destined to fall apart soon, if it has not already. The two maps were used further in a “letter-to-editor” in Watkins Glen’s local online Odessa File here: http://www.odessafile.com/forum-CreaMaps which should hit the local audience pretty good. There is already a local-backlash developing over the attempt by the “Ithacans” to clog and overwhelm the Reading/Schuyler Court system, as they are now pleading innocent and demanding trials after the judge started handing-out Civil Judgments instead of jail. Their own videotapes will be hard evidence to beat, though!